If an individual goes to work and they spend eight hours every day sitting at their desk, they will become very concerned with comfort. They will want to personalize their desk to make it feel like it is their own. They will want to have everything on hand immediately. Further, they will want an ergonomically optimal office chair. If one is sitting in the same chair all day, it needs to be comfortable, contorting to the human physique to prevent back pain. It also needs to be stocked with cushions. 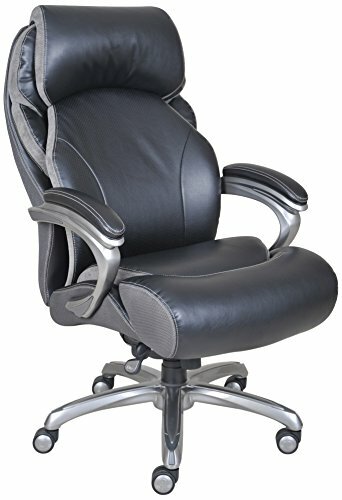 The worker needs a chair that will allow them to focus on their work. 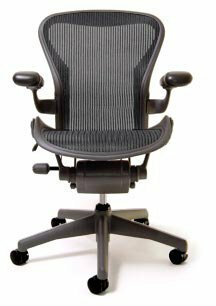 To aid this quest, we take a look at ten of the best ergonomic office chair options you can buy. Let’s get started. Adjustable back rest is a must. We come in all shapes and sizes and having an adjustable support for your spine should be a core consideration in the best ergonomic office chair. Adjustable seat height. The optimal seating position will have feet flat on the floor with knees more or less at a right angle. if feet are dangling that is not optimal, and neither is being too close to the ground. You are more likely to slouch when the seat is too close to the ground and there is added stress to the knees. Lumbar support is another benefit to have from the best ergonomic chairs, as this helps provide additional support to lower areas of the spine. 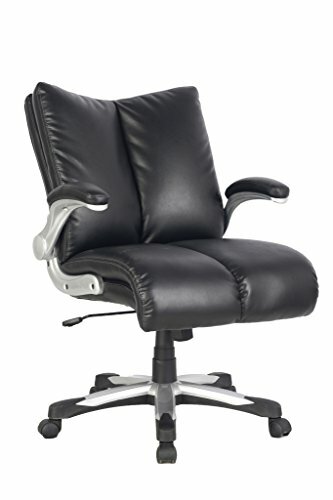 Adjustable arm rests are another must have for the best ergonomic office chair. They should provide support for typing. 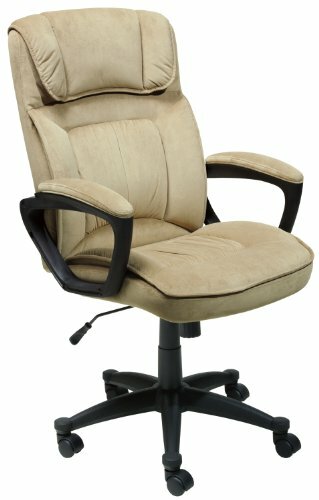 Departing from the standard black of office chair, this sleek beige model serves as both as an attractive decorative maneuver as well as one of the most comfortable office chairs on the market. Since it has a cushioned headrest, coworkers may often ask the individual sitting in the Serta how it is that they have not yet fallen asleep. This question will be further emphasized as they observe the layered body pillows spreading across the Serta. This office chair seems to capture the philosophy of the sofa and the efficiency that one needs to get their work done. 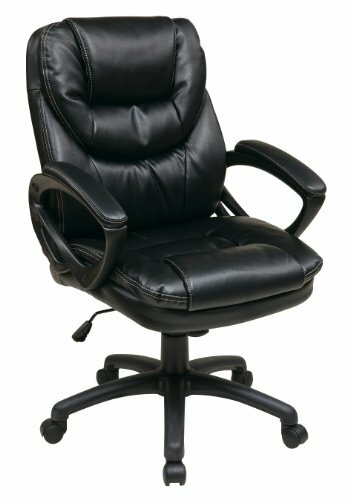 The manager needs a comfortable chair. A position of power that sways all of the intricacies of a particular office can create a stressful environment, and the last thing the manager needs is a back that hurts and a chair that is uncomfortable. Since the Worksmart has built in lumbar support, they will not have to worry about back pain after prolonged use. 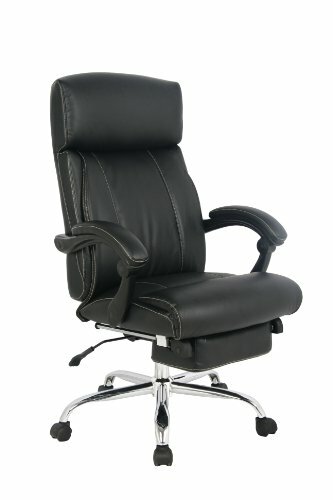 Further, since it is cushioned with faux leather and has padded armrests, the manager will be able to work in comfort. 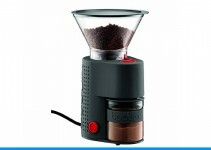 Reviewers report that the Executive is definitely worth the price. Since the PostureFit mechanism adapts to the user’s body and pelvis, they never feel any back pain or discomfort. This pioneering is championed as both an advocate of daily comfort and preventative against long-term back problems. The user also need not worry that they will become too warm throughout the day. The breathable suspensions will keep their body temperature down so that they may remain relaxed and focused. The Execute comes equips with all sorts of mechanisms that circumvent many of the problems that people have in many chairs. With an impressively alluring and captivating design pattern, this office chair looks like something that captures the essence of luxury. It comes equipped with several functions that allow the user to adjust the chair based on their sitting preferences. Each chair will be customized and personalized by the user. This includes back angle adjustment as well as front and rear position lock. 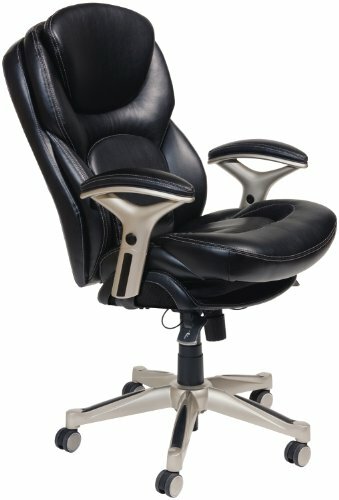 It also has a high quality Nylon base that gives the chair great stability. When in doubt, add more cushions. People will not be likely to complain that there were too many cushions. This VIVA office chair comes with extra thick padding for optimal comfort. Since it also has an adjustable tilt and seat height, the user can tune the chair to suit their needs. 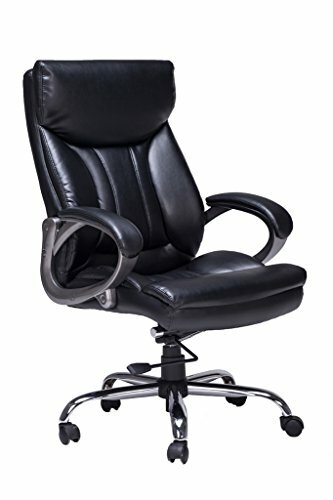 Most reviewers report that this is the chair that exceeds all of their expectations. Perhaps that can be credited to the leather upholstery, designed specifically to give the user hours of uninterrupted comfort. 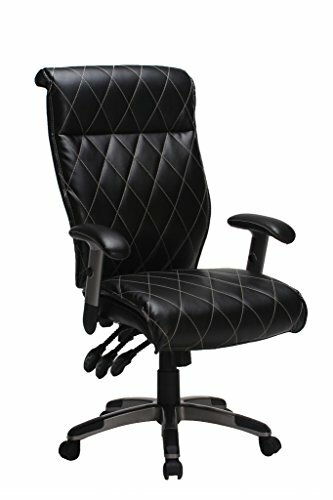 An atmosphere of professionalism and quality will be generated when this chair is complementing a desk. The rational consumer would have a lot of trouble looking away from this chair as they are browsing the web. They will be compelled by the special interest that developers have taken in supporting their back. This chair is designed specifically to keep the back comfortable. The extra padding will also provide the comfort that you need to function efficiently throughout the busy work day. The Serta is designed for the person who is concerned for their health and wants to live a health lifestyle. It is designed for the individual who wants to be proactive about their health and maintain a healthy and fit lifestyle as life progresses. The Serta is designed for the individual who wants a chair that will not leave their back crippled in the later years of their life. With lumbar support and heavy, smooth leather pillows, the Serta chair is hailed by reviewers and a chair that supports the health and wellness of the individual. Rational consumers view this chair as a wise decision. In the contemporary west, everything is getting smarter, faster, and sleeker. Technology is being implemented in places that we would not expect to serve functions that we could not have predicted. This is exemplified in the Serta Big and Tall Chair. It comes equipped with AIR technology meant to enhance lumbar support and allow the body to move around and adjust its’ posture. It even has a generous seating area to either seat somebody up to 400 pounds comfortably. Since it comes with a high back, this VIVA encourages the user to sit with a proper posture, with their back straight, and to do so comfortably. Since it offers thick padding and lumbar support, the worker will be able to focus on their job rather than aching in pain about their back. Reviewers report that if they are focused on efficiency, they could engage the lock mechanism. But when they disengage it, the chair will serve as a rocker as they comfortably draw the day to a close. 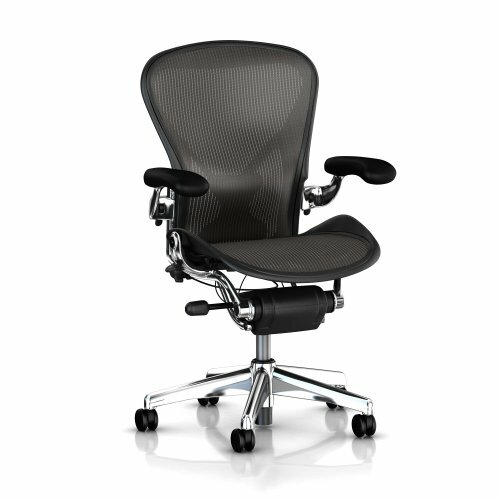 The workers who are concerned with both luxury and the fulfillment of ergonomics need to look no further than this Aeron Task Chair. 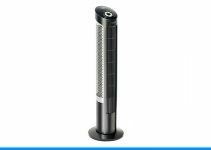 The advanced fiber technology evenly distributes pressure. 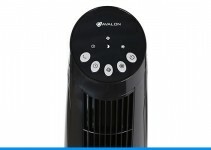 This will maintain a comfortable temperature in any season. It will also keep up with your posture. If you shift, the mechanisms in the chair shift with you, so that you will persist in maximum comfort throughout the day.